I am not a huge fans of bilingual books because I am often disappointed in the quality of the translation in one language. Usually, bilingual books are based on a story written in one language and then translated into another. The texts are often side by side or below each other and more often than not the translated version lacks a certain je ne sais quoi (cultural references, awareness, etc). So I was quite excited when I heard about a new series of books aimed directly at bilingual children and written for them in two languages. Those two languages also happened to be French and English so that worked really well for us. We were sent "I don't know what to wear" or "Je ne sais pas quoi mettre" from the collection. The major positive point for me was that the story is not a translated version of another language. The story is written in English and French: some of the characters speak French and others speak English. This is great and unusual for children's literature. While I do not often read books in English to LJ, I thought I'd give this a go. I should mention first, if you are not familiar with my blog, that LJ is now 4. She loves books and stories. We read every day. She is fluent in French and has (mostly) great receptive skills in English. The book is available as an ebook or a hard copy. It is the first of a series that will follow the same principles. 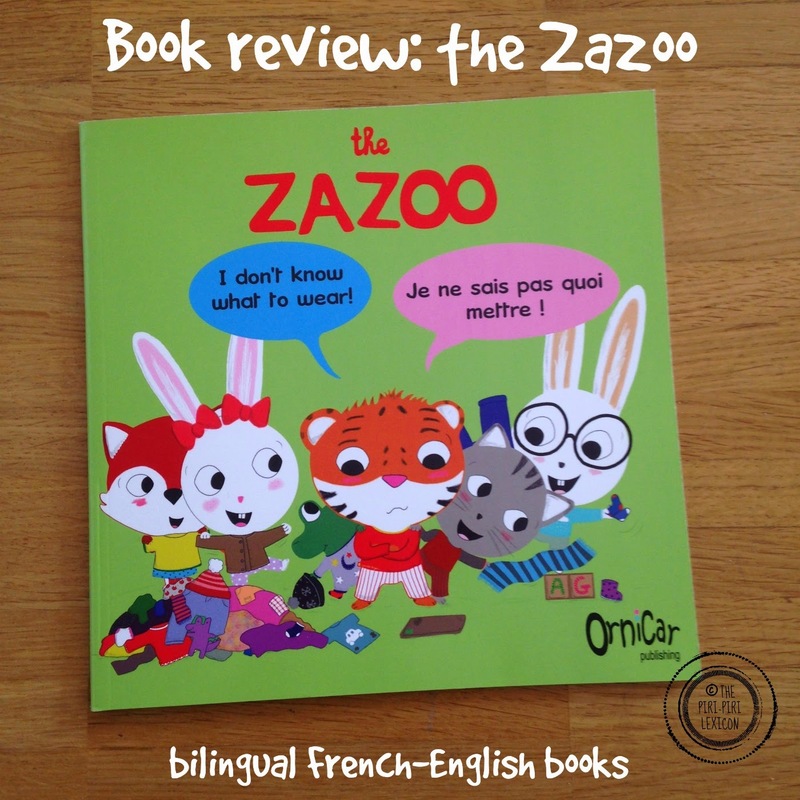 The story is about: mischievious French-English bilingual animals: the Zazoo who speak and respond to each other in both languages, switching from French to English. The author claims that : "Whether children are already bilingual or have just started learning a second language, they will improve or maintain their language skills while discovering the story. The absence of literal translation makes the book less teachy and the learning process is more stimulating and effective." Other activities based around the story are available too. Our first read was a little unusual as she is not used to hear me read to her in English, as I wrote earlier and so she kept asking what X and Y meant even though I am 99% sure she understood perfectly. Once we got past that stage, she never asked again about translation or meanings. She loved the story and we read it almost daily for about a week. She laughed out loud at the jokes of Krok and Minikrok. Despite loving the bilingual nature of the of the book and the concept behind it, I am not entirely sold on the details. I think there is still a lot of room for improvement. To me, this book tries to do too much and tries to appeal to too many markets to be great. The book is meant to be aimed at 2-7-year olds. Now, I am sorry but this is too large a population. A 2-year-old will not be interested in the same things as a 7-year-old. Also, it is meant to be for bilingual kids and for children learning a second language. This is where the main problem lies. My 4-year-old girl fluent in French is way past this kind of stories. Yes, it was fun and she liked it, but I would not have picked it in a bookstore. The story is too basic.. 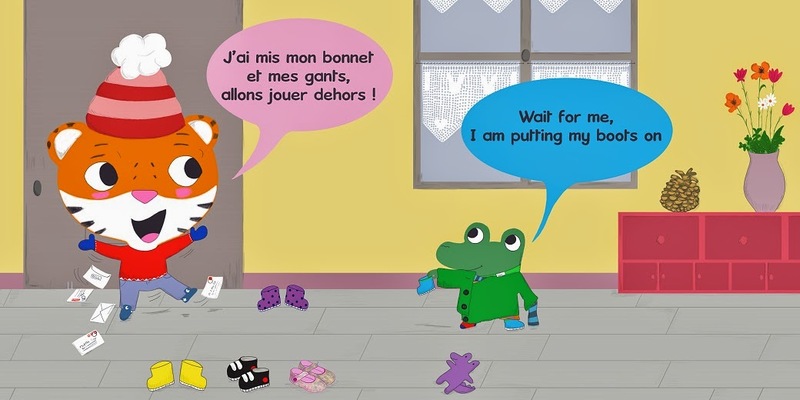 Even in English (the weakest of her two languages), the vocabulary is not challenging enough and the plot of the story too weak for a 4-year-old: a funny character trying to decide what to wear is more of the level of a 2-year-old. 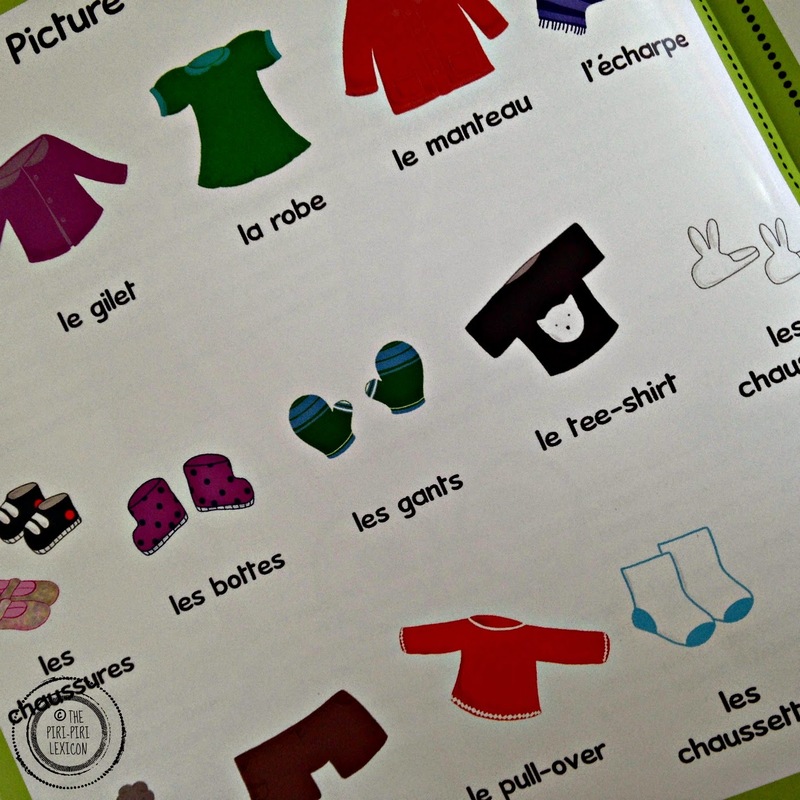 Finally, the book comes with vocabulary sheets (in both languages) to encourage kids to learn the words for the clothing items presented in the book. Of course, LJ is too young to read, so this is of no use to us. This would only appeal to early readers or non-native speaking parents. To sum up, I think this book is better suited for a young child learning either language as a second language. I doubt many 'already bilingual' kids will actually find that book satisfying. I can see this book being used with children being introduced to French or English as a foreign language at an early age and would happily recommend it for that purpose. Disclosure: I was provided with a free version of the book in exchange for my fair and honest review. I found your thoughts about this concept of bilingual books very interesting and thought provoking. I live in Malaysia, and have often pondered how to write a solid bilingual book here because I usually don't like them for the same reasons you mentioned in your intro. I wonder if this idea of having different characters speak their own language rather than translating could work here and in Indonesia. Definitely food for thought. I'm so glad you shared this at Booknificent Thursday! Thanks. Will check it out now.